A special release for the 90th Anniversary of Mickey Mouse! Mickey was never so thrilling as when he was drawn by Disney Legend Floyd Gottfredson. 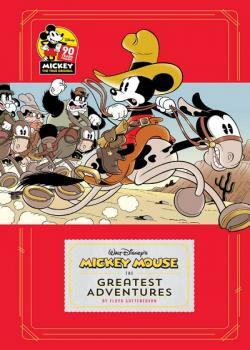 And this commemorative full-color edition collects the best of those irrepressible Mickey adventures, including Gottfredson’s first — written by Walt Disney himself! Mickey’s intrepid escapades include a frantic race against Pegleg Pete for a hidden gold mine, an epic struggle against the sinister Rhyming Man for control of an atomic disintegrator, the vexing hexing of Mickey’s hometown by a horrible hypnotist … and that’s only the beginning! Floyd Gottfredson delivers one death-defying feat of derring-do after another in this showcase of a master storyteller at the top of his form!